Sharp Innovations Client to be Featured on Fox &amp; Friends Sunday Morning | Sharp Innovations Blog | Sharp Innovations, Inc.
One of the nation’s most popular TV hubs every Sunday morning, Fox and Friends, will host current Sharp client, BeBalanced Hormone Weight Loss Centers, this Sunday morning. BeBalanced has contracted us for a full website redesign, plus several elements of programming (like the integration of custom franchise landing pages) and search engine optimization services. Further, this Sunday will be the launch date of the newly redesigned website; the Sharp creative team has worked around the clock and after hours to have the ability to “go live” for our client’s special air time. Struggling with weight is a reality for people all across the United States. Founder, Dawn Cutillo struggled with her own female-related health issues and inability to lose weight, and wondered what kind of impact hormones played on the constant struggle. Born right here in Lancaster County, BeBalanced Hormone Weight Loss Centers began to quickly grow and catch the attention of the national media. Featured on NBC, CBS, and The Doctors, BeBalanced will follow suit this Sunday on another popular program, Fox & Friends. Just in time for their big opportunity, we’ve helped to launch a brand new website in celebration of this great news. 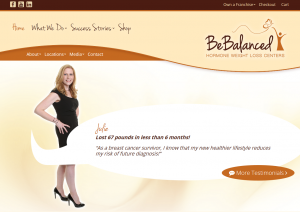 Originally scheduled for a mid-June launch, BeBalanced had quite a bit of work remaining before the website was ready. Once they received the great news that they’d be featured on Fox & Friends, however, they came to us and asked if there was any way to accelerate the process. Happy to help, the team here at Sharp Innovations along with the team at BeBalanced put in some extra hours to make this a reality. We’re proud to announce the launch of BeBalanced Hormone Weight Loss Centers new website, and encourage you to go check it out at BeBalancedCenters.com! Be sure to check out Fox & Friends this Sunday, June 12th as well. Posted in Branding, Website Design, Websites and tagged bebalanced hormone weight loss centers, cbs, fox & friends, nbc, the doctors on June 11, 2016 by sharpblog.